What Is Meant By Magazine Theme? 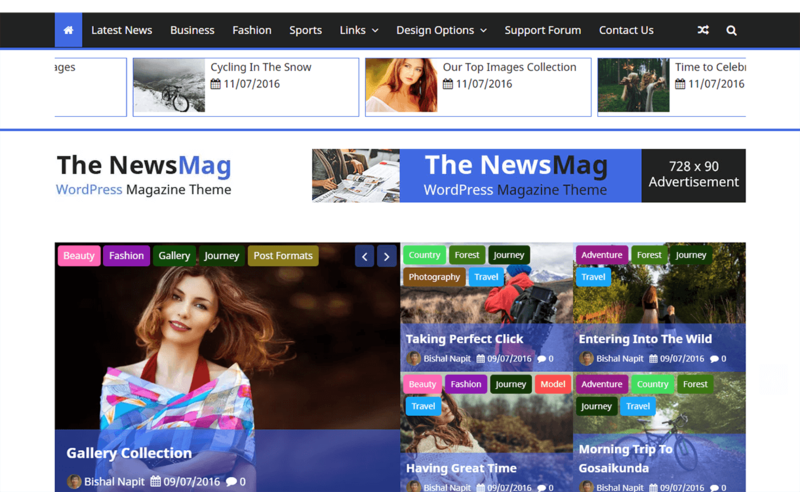 Among varieties of themes, one of the most popular themes is magazine theme available on the different platforms. You can find free and premium themes in this magazine list. Free magazine WordPress themes can be found on WordPress.org whereas premium themes are available in different marketplaces. There is not an exact meaning of magazine theme but the best description of the theme will be a digital version of your good old, traditional magazine. This means that there are a lot of pictures included to support a story or content with the help of multiple layouts. Magazine themes come with sliders, the plethora of shortcodes and pre-defined layouts. 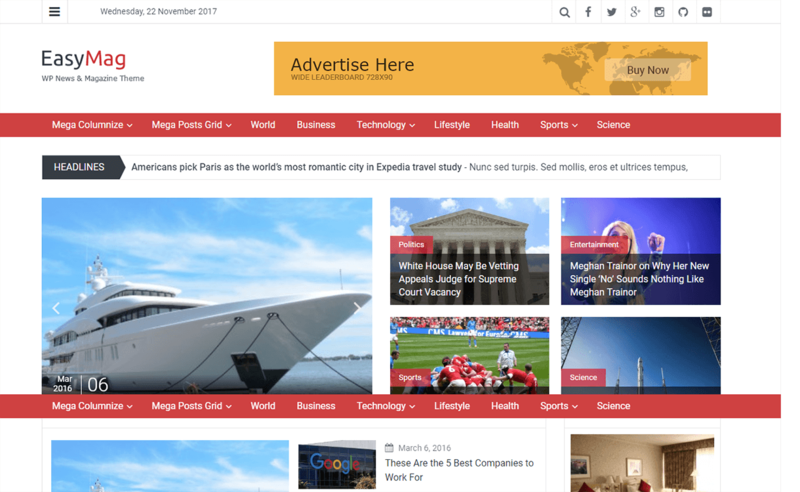 Magazine themes are used to create online magazines, editorial, newspapers, and many more news websites.They need to showcase a large amount of content on the single screen by making your content quality good and beautiful. So, some of the beautiful websites which are built from magazine themes are here. 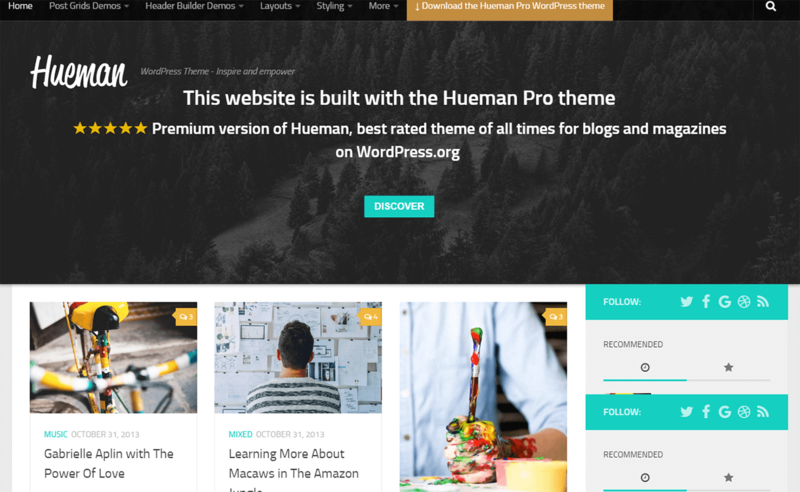 Well, in 2019 magazine and blogs themes are best-rated themes among 5000+ themes available in WordPress.org theme repository (including both premium and free themes). And 8000+websites are running whole around the world on today’s date. Generally, blog and magazine themes are related to each other. But there is a difference between these blog and magazine themes, though their main goal is to publish the content and share it with the world. Blog themes are commonly used for personal use and have a limited number of audiences compared to magazine themes. And specifically, it is not made to earn money. Whereas magazine theme is used for professional use and should look attractive because with a blink of an eye visitors judge your site. If you are unable to engage your visitors then you won’t be able to make a huge traffic where the important part of magazine theme is to make a huge traffic. And magazine themes are used by magazine and news companies to showcase their content. How To Choose The Best Free Magazine Theme For Your WordPress Sites? However, there are numbers of free themes available in the market but among them, WordPress is the best platform where you can get many advanced themes with different powerful features that you are looking for. Among these themes also the best way to choose the right one is by looking its support, look and theme functionalities. These three are the main points to keep in mind while you are going to use any magazine theme for your new website. The theme should be fully responsive, SEO friendly and customizable because without these function your site is useless. Another thing that you need be careful is the design of theme because magazine site needs to look beautiful to attract the people so that it will be helpful to make traffic to your site. And the last point that is important is support. Support is an essential part of building a site. So, before using any theme you should know whether the theme developer will be supporting you or not in future if you have any difficulties related to the theme. How About Premium Magazine Themes? Talking about premium themes, it’s not a bad idea to use premium themes also. There are many premium magazine themes available on many platforms. Mostly in premium themes, there are more features compared to free themes. But it doesn’t mean that free themes are not that useful. If you are using a free theme then, you can know more about that theme by upgrading the same theme into premium version later on, so that you will get an advantage of that theme. There are various platforms where you can get premium themes like AccessPress Themes, 8 Degree Themes, aThemes, Themisle, or more. For more details about the marketplaces where you can get the premium themes just click here. I have compiled a list of 25+ best free magazine WordPress themes that are available. Of course, there are much more themes but these are the themes that have proven to be useful and some of them are jaw-dropping amazingly. 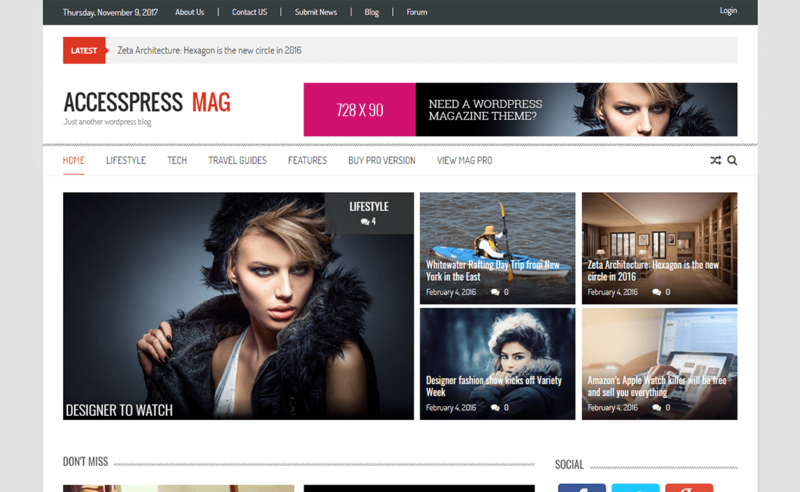 AccessPress Mag is a feature-rich free magazine WordPress theme best suited for the online magazine, news websites, editorial related projects, blogs or personal websites. The theme is simple and beautiful which is fully responsive and search engine optimized. It has multiple layouts so you can choose any of them. This theme includes YouTube tutorial and detailed documentation that make easy to use the site for users. It is tested in all the browsers which work perfectly. The theme has a cool slider of featured posts. 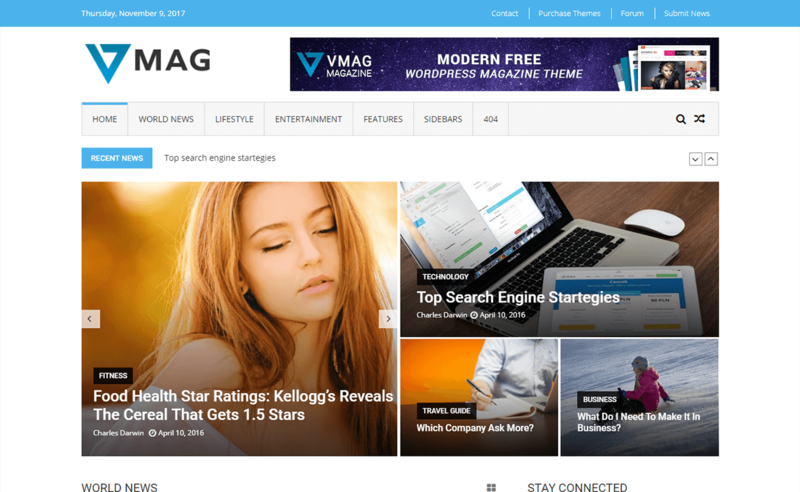 VMag is a free responsive magazine WordPress theme for online magazine, newspaper and professional blogs. The theme is simple and easy to use that can be used by any platforms, any devices, and any browsers. This theme is fully built on customizer tool that allows you to customize the settings easily with live previews. It is completely built using clean code by making the theme secure. The theme includes features like bold typography, large image and beautiful colors that make the theme ideal for magazine and newspaper. 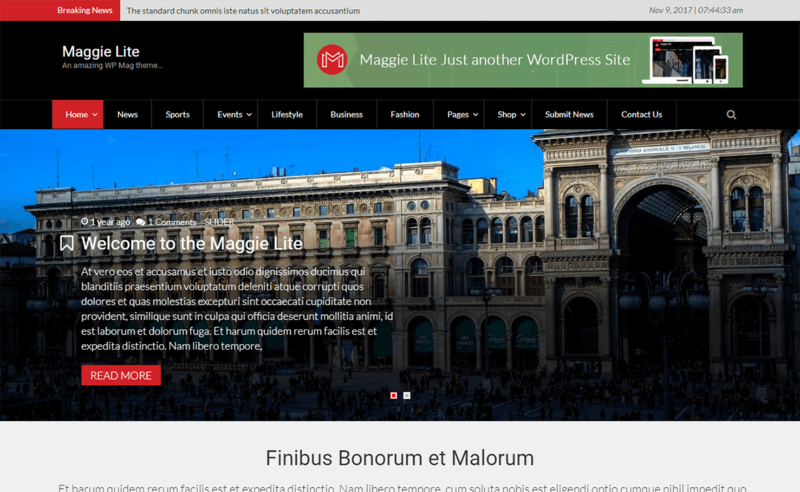 Maggie Lite is a free magazine WordPress theme. The theme has a clean and simple design that is ideal for creating different websites like a newspaper, editorial, online magazine blog or personal website. It is fully responsive theme with many powerful features that have fast loading support. This theme has boxed and full-width layout where you can choose the layout that you like. There are two theme color options that are dark and white so you can choose that color that you like. 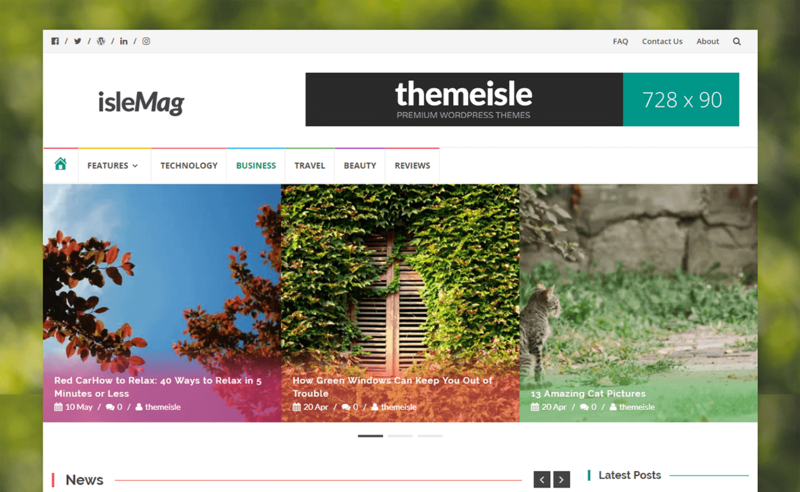 IsleMag is an excellent free magazine WordPress theme. The theme is suitable to use in all the major browsers of the Seven Seas. If you are not an experienced developer then no need to worry you can easily update the theme settings through theme options panel that is included in this theme. It is clean with validated code that can be editable by any person with enough knowledge of HTML/PHP. GreatMag is a clean and modern magazine WordPress theme which has all the tools that are needed to build a beautiful news site. It is a fully responsive theme that fits onto any device. The theme color and fonts can all be adjusted as you like. The theme is 100%translation ready that helps to change the language to the required one. Advertisements are supported in this theme in case you find an advertiser who wants to post the banners or you’d like to link up to Google Adsense. 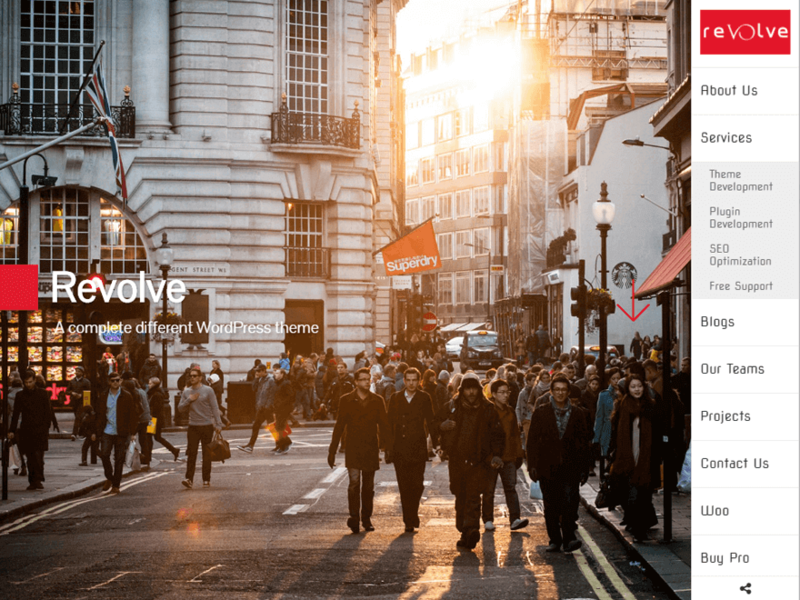 Revolve is a perfectly designed modern free WordPress theme that is suitable for newspaper, magazine, portfolio, personal blog, photography or any other use. The theme includes a cool customizer that allows you to customize the theme. It has many useful features from which an awesome site can be built quickly in an easier way. This theme offers you many options for building a website instantly. 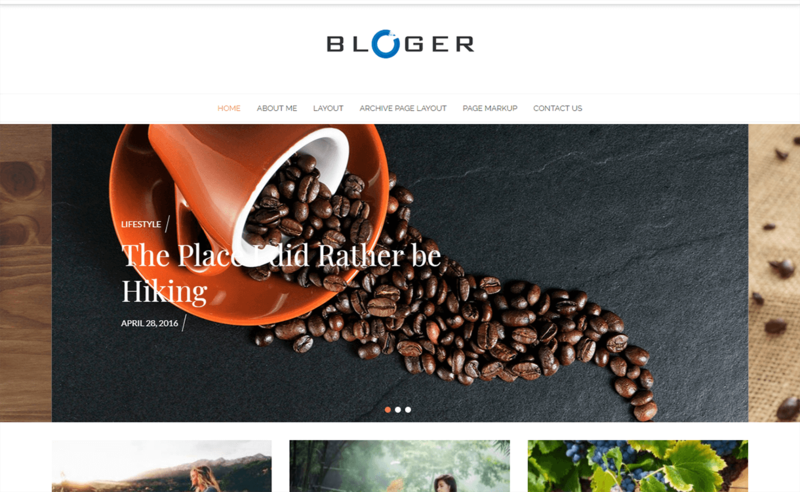 Another amazing WordPress Theme is Bloger that is suitable for building news, magazine, personal or professional blog, and company or organization blog websites. The theme is fully customizable with many useful features that are perfect for creating a complete website that you are looking for. It is fully responsive that is adaptable and looks beautiful from all the devices. This theme has three stylish homepage layouts and three beautiful archive layouts so you choose any one of them that you like. Another simple and easy to use magazine WordPress theme is NewsAnchor. 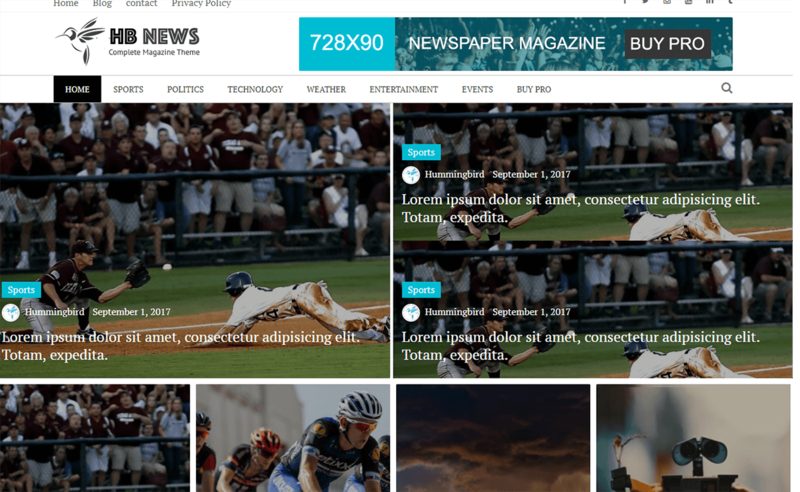 This theme has a fresh and modern look that is great for online news sites. The theme has many useful and advanced features. It has over 600 Google fonts which are a huge benefit to standing out with strong text. This theme includes social media button and widgets. These widgets are great for your posts to display in style. The theme has color options that give you the opportunity to change the color for almost all of the theme elements. MH Magazine Lite is an awesome magazine WordPress theme from which an online magazine, dynamic news website or professional blog can be created to publish their content within a few minutes. 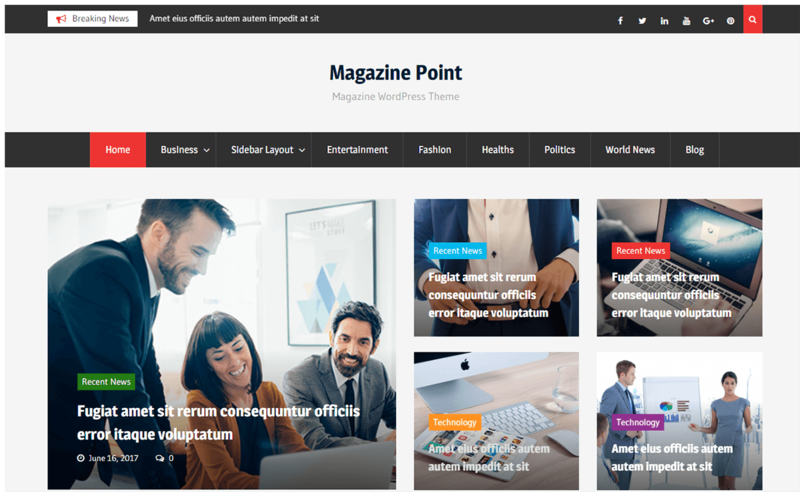 This theme has become very popular magazine theme for WordPress that is running thousands of websites around the whole world. It has many amazing and powerful features. But if you like to take the advantages of features like layout options and custom widgets then you can upgrade premium version of this theme. 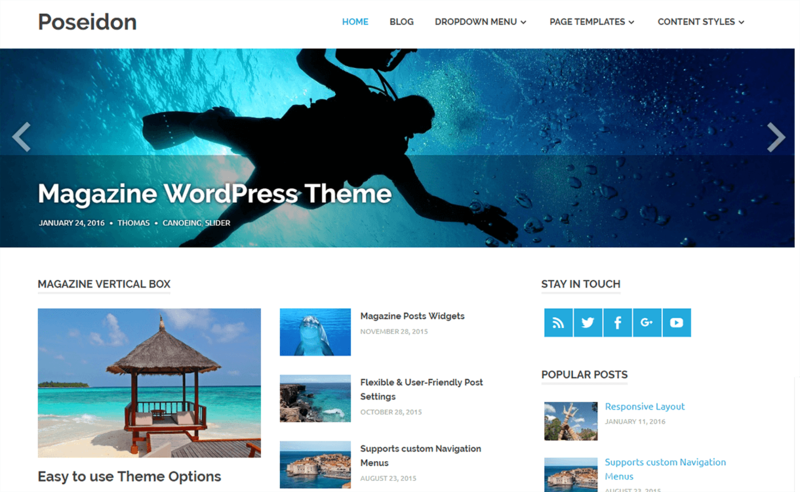 Poseidon is a stylish and flexible free magazine WordPress theme. 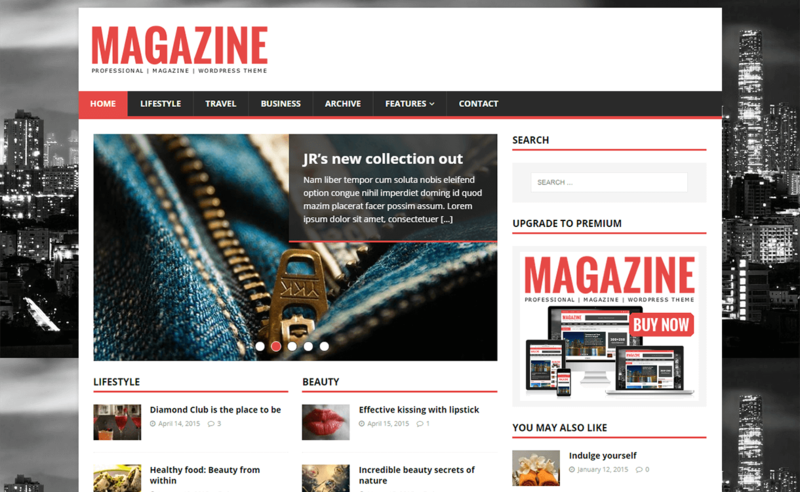 This theme is perfect for creating magazine and news website. It has clean typography and spacious white layout that helps to make it great to share your stories. The theme has widget-based magazine homepage template which makes an elegant website. Poseidon comes with an attractive full-screen image post slider that highlights your important post. 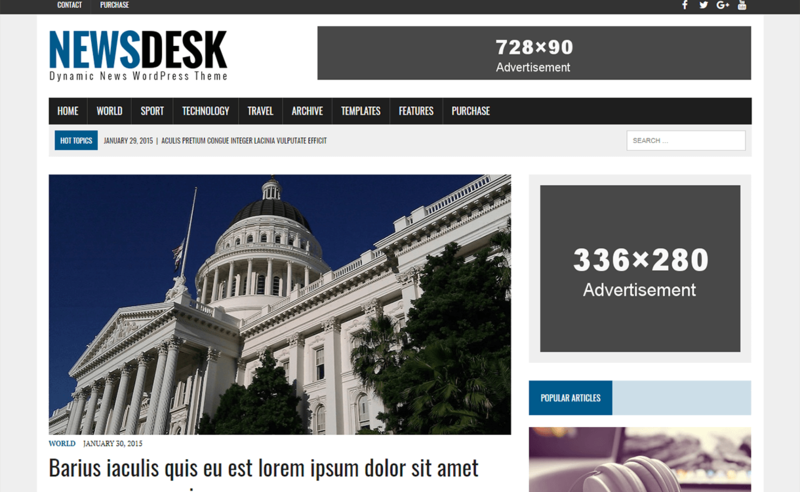 MH Newsdesk Lite is a stylish magazine WordPress theme with an elegant flat design with great flexibility. 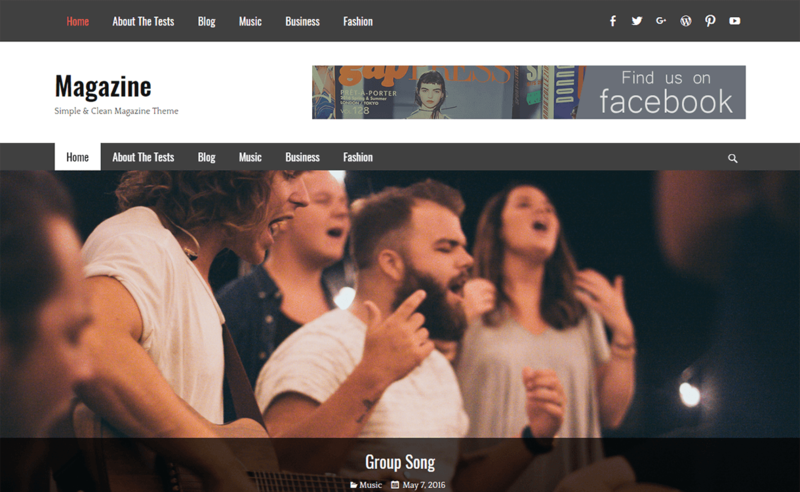 This theme is perfect for up-to-date blogs, an online magazine and all types of news websites. It focuses on your fresh content and newsworthy. The theme has an advanced feature that helps to make your site an ideal one. MH Newsdesk Lite is fully responsive to all the devices and SEO friendly. This theme includes live preview customizer that helps you to view the changes you have made live.The theme is distributed under the terms of the GNU GPL. It can be customized in every way like you prefer. 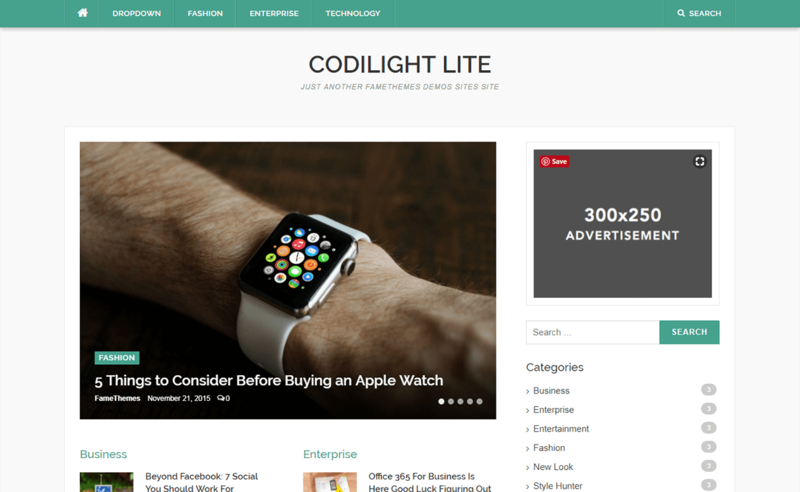 Codilight Lite is an awesome news or magazine style WordPress theme that is suitable option to create any types of magazine or blog websites. With the help of built-in customizer, this theme can change the aspects of the design quickly. It has latest advanced functionality features with HTML5 and CSS3. The theme does not include unwanted stuff so it is optimized for speed. When you purchase this theme it comes with 1-year support. 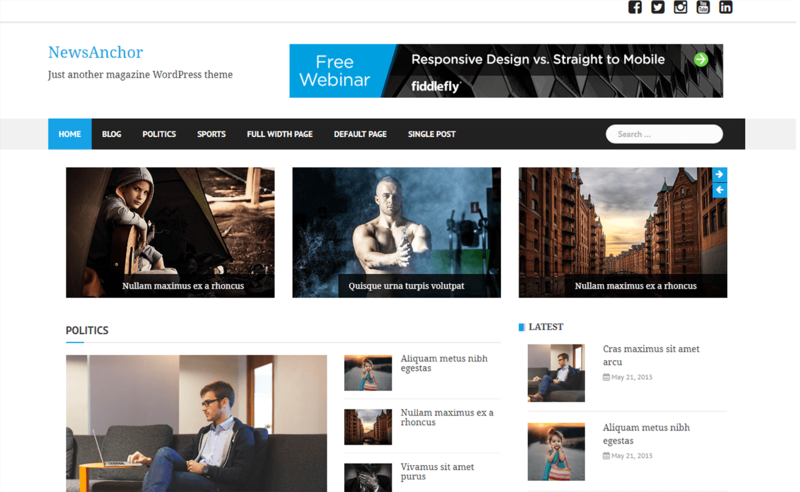 Dynamic News is a fully responsive multipurpose blogging and magazine WordPress theme. It has bold colors and fonts. This theme comes with an attractive featured posts slideshow that can be displayed on the front page template and on the normal blog index. The theme includes powerful theme options that support the customizer for all the theme relevant settings. It allows you to easily add a social icon and search box to the right of the header area. 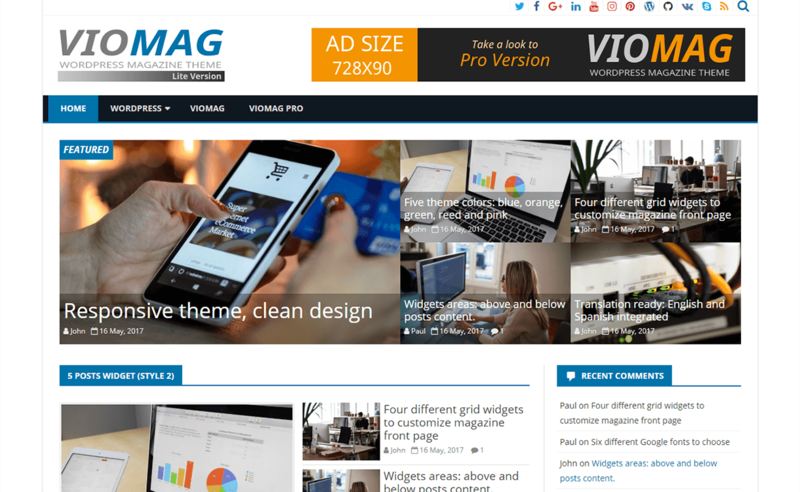 VioMag is a modern free magazine WordPress theme that is suitable for magazine, newspaper, news and blog theme. It has a clear and neat design that is perfect for creating a site. There are five different custom theme colors (blue, green, orange, pink and red) so you can select the color that you prefer. The theme is fully responsive to many amazing features. Hueman comes with many useful functions that have a versatile design. The theme is used by many websites like a magazine, blogs, small businesses, schools, church or personal websites. It is fully responsive that makes your site beautiful from all the devices and also loads faster which is very easy to use. This theme includes free add-ons plugin that has a unique customization technology allowing you to customize the page of your website that you want. Newspaper Magazine is simple theme yet with a beautiful design free responsive WordPress Magazine and News theme. 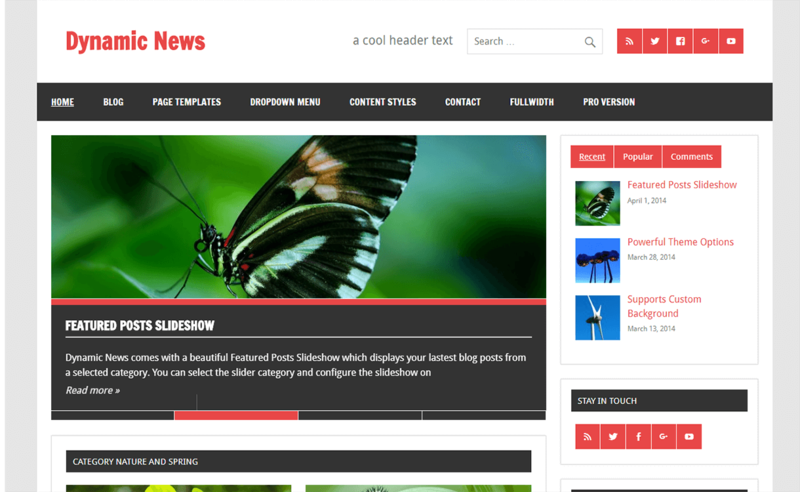 This theme is specially built for news, magazine and blog websites. It is fully responsive and SEO friendly. The theme is compatible with the entire browser. You can have a great customer support through online chat, email, and support forum. 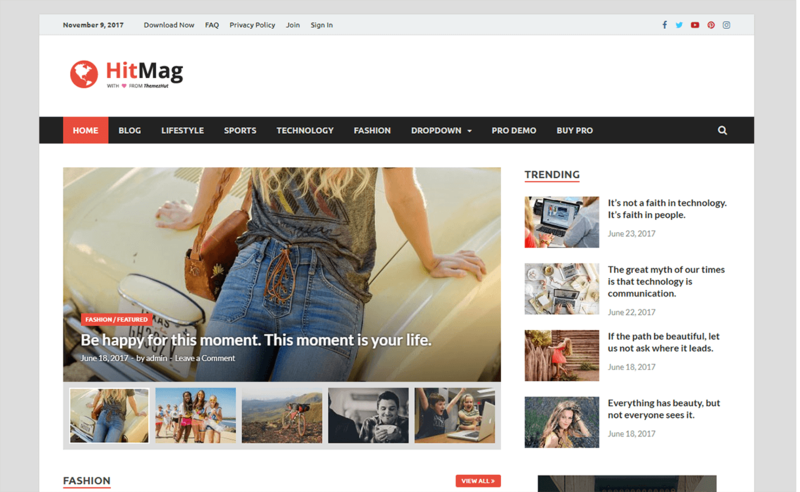 HitMag is a simple and flat WordPress theme that is crafted for magazines, newspaper or personal blogs. The theme comes with a bunch of options to customize the websites as your preferences. It includes a magazine homepage layout, 4 different style blog listing layout and main color options. This theme has so many features that fulfill all the basic needs. The theme has an image slider which gives a nice impression of your site. Metro Magazine is a user-friendly WordPress magazine theme with a sleek design. This is resourceful and easy to use with many useful features. It is not loaded with unwanted stuff though the theme is extremely customized. The theme consists of the responsive layout design that fits for presenting images and content in a beautiful way. It has the capability of adapting the various types of the magazine with advanced customization options. 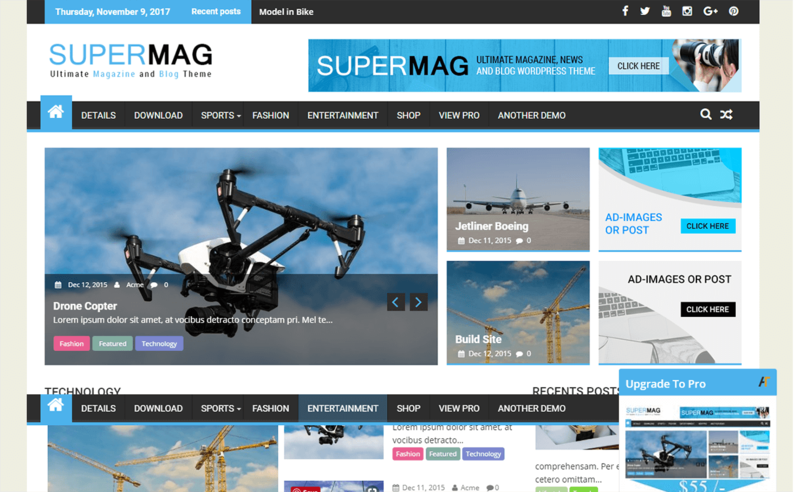 SuperMag is an ultimate theme of the magazine that is presented by Acme Themes. The theme is specially built for news, magazine, and blog that are suitable for any magazine style site. The advertisement can be added from customizer and widgets because this theme is an advertisement ready theme. The color of the whole site can be changed with a single click. You can also customize the header, footer, sidebar, main homepage and inner sections. The NewsMag is a magazine WordPress theme that perfectly matches your need to create a beautiful site. It is useful for building a magazine, newspaper, blog or personal sites. This theme supports almost the entire post format that is available in WordPress to display the post of your site. The theme displays the latest post as the headline and supports the custom menu. All the style of this magazine theme is controlled by the widget to make them display in a unique way. 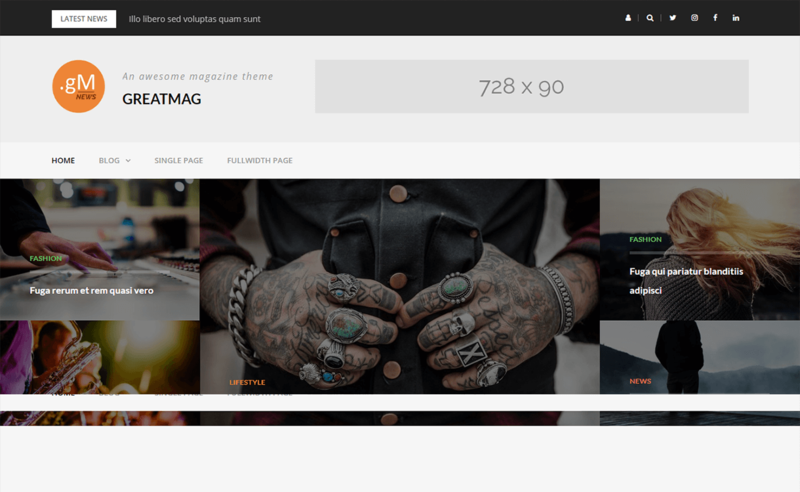 EasyMag is a free responsive magazine WordPress theme with a professional outlook. The theme looks beautiful on all the devices. EasyMag is built with bootstrap. It includes the theme customizer that is used to customize and set up the basic settings like color, logo, and layout. The theme does not require any coding knowledge that helps you to put together the ultimate news site. It consists of the boxed and wide layout so you can choose the one you like. 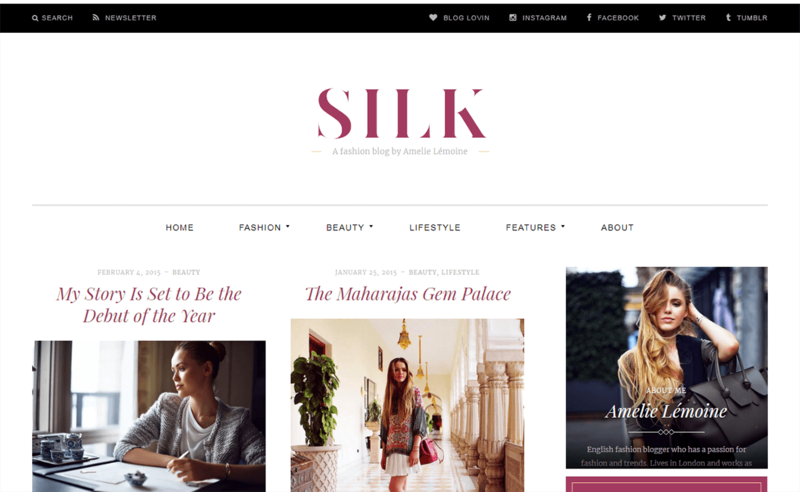 Silk Lite is a powerful free magazine WordPress theme that is built with amazing features for creating magazine, newspaper and fashion blogger websites. The theme is fully responsive that looks elegant in all sorts of devices. It is compatible and tested in the entire browser. The theme is translation ready that helps to change the language as your requirement. 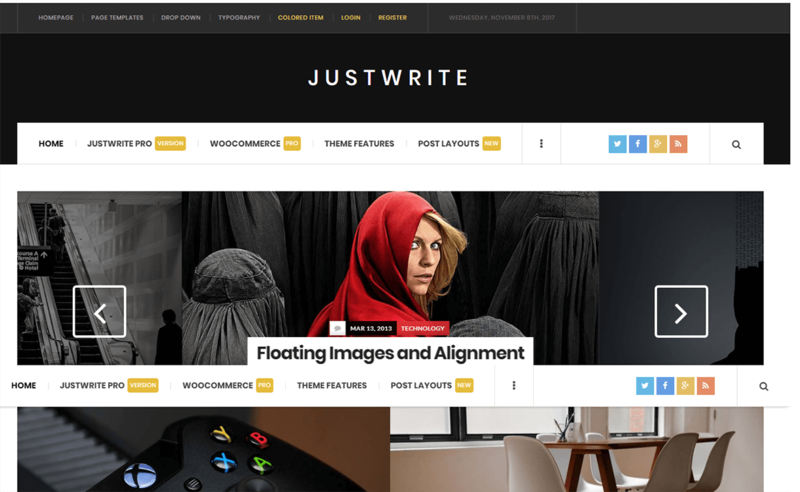 JustWrite is a fully responsive free magazine WordPress theme. This theme has a live customizer tool that allows you to make the changes and have a live preview. You can also add your ad banners through the customizer easily. Just copy and paste the code and it is ready. The theme comes with an extensive documentation that will guide you to get your site up and run quickly in a perfect way. It helps you to customize and create your homepage layout with 10 sections and 8 custom sidebar widgets. Magazine Point is an excellent magazine WordPress theme. This theme is created with the eye-catching design, high-quality code, and essential features. The websites like news, magazine, or blog can be built through this theme within minutes. Yet it manages to make your site look beautiful. This is the best magazine theme where all the features are easy to use and codes are customized easily. Also, the theme provides the best support for anyone if there is any problem with the theme. Royal Magazine is a feature-rich and fully responsive free magazine WordPress theme. The theme includes amazing features that help to create a beautiful website. It is built with Bootstrap 3 framework and tested on the entire browser. This theme looks stunning on all the devices. This theme supports an elementor plugin and is SEO optimized. 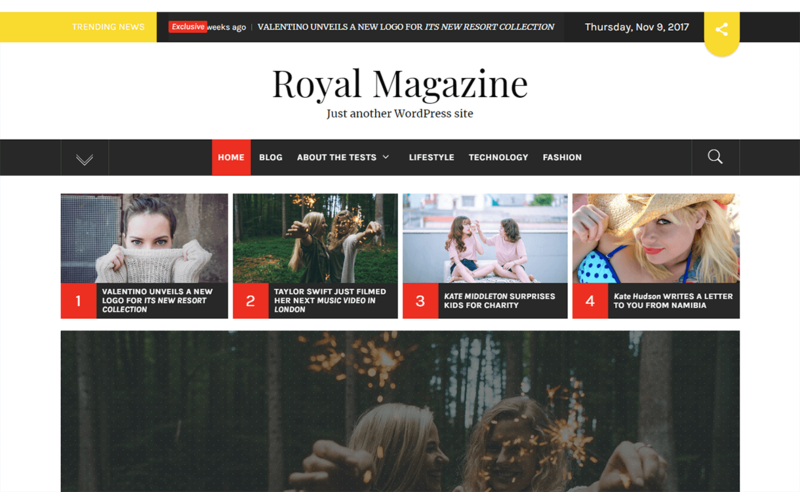 Royal Magazine is fully compatible with WooCommerce. Clean Magazine is a simple and elegant free magazine WordPress theme that is designed for magazine and blogs. It is fully responsive and SEO friendly that is easy to use and understand. The theme has many amazing features like incredible support, featured page slider, WordPress standard code, etc. It is translation ready so you can choose the language that you like. This theme has an awesome design which helps to attract the viewers. As a whole I have tried my best to give some knowledge about magazine themes like what does it mean, the difference between blog and magazine theme, how to choose the best free magazine theme from WordPress and also mentioned some details about premium magazine themes too. 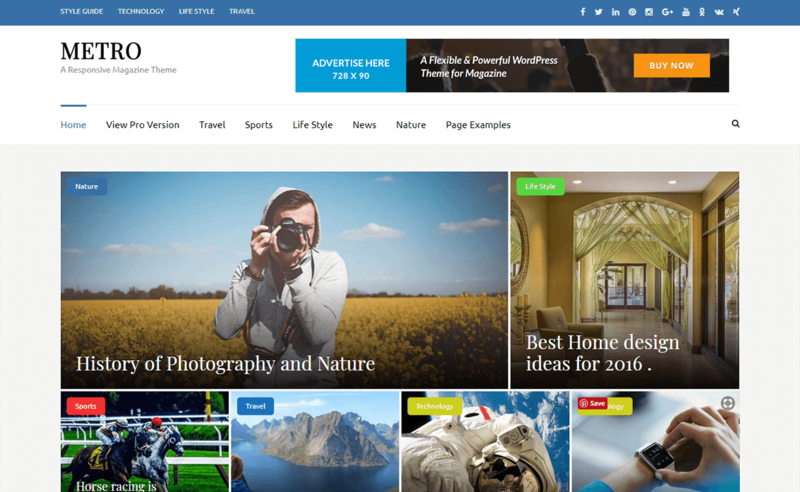 The above free best magazine themes have powerful and advanced features that help to build a new site or re-design your old site in a perfect and beautiful way. So, if you want to create an elegant and stylish website, just give it a try with these popular free magazine WordPress themes. I might have missed mentioning some great and cool templates on my list. Feel free to share your opinion and suggestion with us, I will heartily appreciate it. Hey Buddy!, I found this information for you: "25+ Best Free Magazine WordPress Themes For 2019". Here is the website link: https://wpallclub.com/best-free-magazine-wordpress-themes/. Thank you.